What it means, why it matters, how you get there. Sponsored by NetApp. Like cloud computing, cloud storage can provide massive economies of scale. You get more IT capacity for less money because the infrastructure is being shared across multiple clients or business units. Additionally, sharing resources enables agility, which translates into faster time to market. In this channel, we will feature industry thought leaders as well as NetApp speakers to explore moving enterprises to the cloud. Hint: It’s not a sprint, it’s a journey. In this webinar with CenturyLink, discover 5 steps to take today to move toward a secure, fast and flexible hybrid cloud environment. Best practices and use cases are discussed, along with tips and critical questions you should ask your provider before getting started. We will also offer insight around things to avoid and share common, real-world issues that IT managers face when starting their hybrid cloud journey. This webinar is the third in NetApp’s Hybrid Cloud Exchange Webinar series. Follow this series to discover industry-leading insights, partnerships, and resources to help you embrace the hybrid cloud on your terms. Gain pragmatic, actionable insight on how to build and operate a Data Fabric to take full advantage of Cloud and Hybrid Cloud architectures. Learn about products and solutions which are available today helping Enterprise customers cost effectively manage their on-prem IT estate and extend it to and through the cloud. Explore ways to maintain the same Enterprise control, management and IT operations wherever your IT services are being delivered. 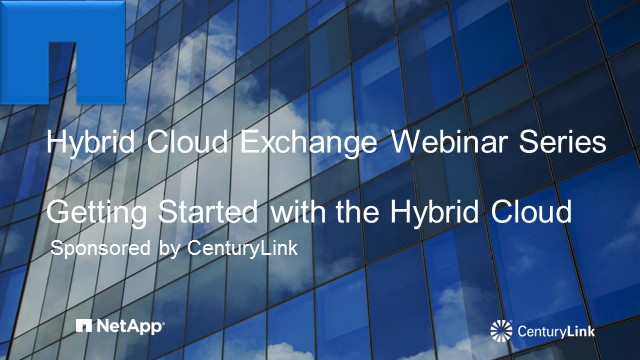 This is the second webinar in our Hybrid Cloud Exchange Webinar series. Follow this series to discover industry-leading insights, partnerships, and resources to help you embrace the hybrid cloud on your terms. Lee Gates is a Senior Director of NetApp Cloud Engineering. He leads a team of talented engineers responsible for product and solution development for Hybrid Cloud use cases such as Cloud ONTAP and NetApp Private Storage for Cloud. Hybrid cloud is the defining architecture for today’s enterprises. Yet traditional hybrid cloud approaches can result in cloud silos, operational complexity, and barriers to extracting value from data. What if you could have a unified view of data throughout your enterprise? Or the ability to store, access, share and protect data across multiple private and public clouds? You can. Join NetApp CEO George Kurian on Wednesday, May 20th at 10amPT to learn the latest thought leadership around hybrid cloud for critical enterprise workloads.